Haley had her annual vet exam last week and since she’s getting a little older, I decided to try out the Pet Wellness Report (PWR) this year. If you’re not familiar with the PWR by Zoetis, it’s a two-part health assessment that combines a set of comprehensive lab work results with survey information you provide about lifestyle factors relating to your pet. The combined results give you and your vet more information to create a preventative care plan for keeping your pet healthier along with early detection screening for serious diseases. Early detection means early treatment and a better chance that a disease can be managed or treated successfully. 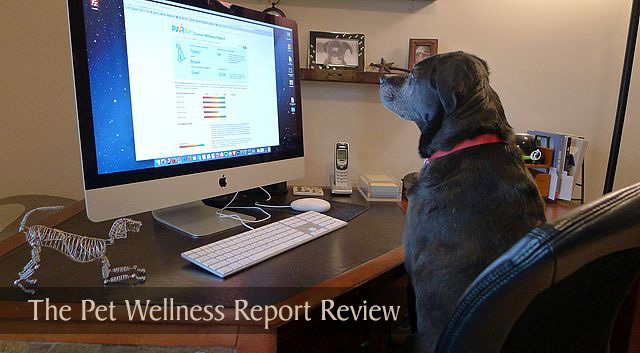 Ok, that was kind of a long explanation, so let me break down the Pet Wellness Report review. Here’s how it works. During your pet’s exam, your vet will collect blood and urine samples for analysis. When you arrive back home, you’ll logon to the Pet Wellness Report website to create your account and answer survey questions about your pet, which takes about 10 minutes. The PWR matches the lab results with your survey answers to create the health assessment report. Your vet will analyze the results of the report and contact you if they have any concerns or recommendations. You’ll receive an email from PWR when your report is ready to be viewed on their website. They state that it can take up to five days for the report, but Haley’s report was ready the following day. Print the report for future reference and contact your vet if you have any questions or concerns about the results. Note: Each report includes an overall health assessment (along with detailed assessments in the areas of Cancer, Heart, Dental, Nutrition and Safety) and your pet’s lab results. Each assessment area is given a rating of Excellent, Good, Fair or Poor. Click the report sections below to view Haley’s health data. The PWR states that a rating of Good is hard to achieve, but I was really hoping for an Excellent rating for Haley. The report translates Haley’s age to be the equivalent of a 48 year old human. Hmm, ok. Excellent (11) – Includes items such as no presence of cancer warning signs, spayed and spayed early, no negative environmental issues like pesticide, chemical or air pollution exposure, good nutrition, receives regular hands-on exams, doesn’t have pale skin, isn’t a long-nosed breed and has annual vet exams. Good (2) – Not being a giant breed and not a long-nosed breed. Poor (2) – Has some dark mouth pigmentation and is over 7 years old. Excellent (5) – No presence of heart disease symptoms, gets monthly heartworm treatment and annual heartworm tests, never missed a month of heartworm treatment and gets regular exercise. Good (2) – Owner limits mosquito exposure and no heart murmur detected. Poor (1) – Doesn’t get annual blood work. Excellent (3) – No signs of oral disease, gets annual dental examinations and is a smaller breed. Good (1) – Gets chew toys and dental chews. Fair (2) – Isn’t fed a tartar control food and has had a broken tooth. Excellent (2) – Not being overweight and owner discusses nutrition with vet. Good (3) – Owner measures food daily, high activity level and gets vitamins and supplements. Fair (2) – Some symptoms of arthritis and receives daily treats. Poor (2) – Possible food allergies and receives table scraps. Excellent (5) – Lives in poison proofed home with emergency vet numbers handy, owner has knowledge of toxic foods, no symptoms of car sickness and has permanent form of ID. Good (2) – Owner uses a leash when Haley is away from home and avoids contaminated water. Fair (2) – Not being vaccinated for Lyme disease and sometimes exposed to other dogs. 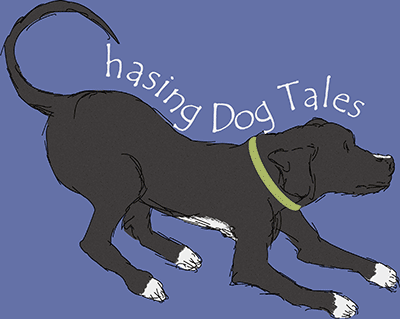 Poor (2) – Some itching and scratching and receives bones and chew toys. Having the option to view the lab results online and being able to print the report was convenient and I did learn a few things, like Haley having an increased risk of cancer due to the dark pigmentation on the inside of her mouth. But I was disappointed that some of the survey questions were too general and because they were usually Yes or No type questions, the assessment didn’t always result in an accurate picture of her health. For example, the question “Do you give Haley bones or toys to chew?” is kind of vague considering there are so many types of bones and toys, and she got a Safety rating of Poor with the explanation that bones can splinter or cause obstructions. The question “Do you give Haley daily treats?” doesn’t account for the type, size or calorie count of the treats and the question “Do you avoid giving Haley table scraps?” is also vague as to what constitutes “table scraps”. Since Haley only eats small, low calorie treats and healthy table scraps (healthy foods that I also eat), she probably should have scored higher in the nutrition section. I also noticed that certain questions that you would think should result in a rating of Excellent, only resulted in a rating of Good. For example, I answered Yes to the following three questions, but each translated to only a rating of Good. Perhaps the PWR scoring algorithm ranks these questions a little lower to make the overall health assessment more accurate. It’s just something that seemed strange to me. The Pet Wellness Report is available for both cats and dogs. Early detection of disease means early treatment and a better chance of successful treatment. The test results give your vet a more complete picture of your pet’s health. During your vet visit, if there’s not enough time to cover all of these topics or if you forget to bring up an issue, there’s a good chance the PWR will address any problem areas that may need attention. Owners get customized tips and advice on how to improve their pet’s health. Lab results are easily accessible and printable for your records or in case they’re needed later. Uncovering potential problems or illnesses may save you money in the long run by addressing the issue early. The Pet Wellness Report is the only AAHA recommended health risk assessment for dogs and cats. Some survey questions need to be more specific or fine-tuned in order to give better assessment results. Some pet owners might consider the cost of the report to be a drawback, as it’s an extra fee added to your vet bill. For me, I feel the cost was reasonable because it brought me peace of mind knowing that I’m not overlooking a medical issue that might need to be addressed. I’m still going to get my table scraps, right? I’m glad I decided to try the Pet Wellness Report program and I believe the benefits are well worth the cost of the report. Since our pets often don’t show signs of illness until a disease is in an advanced stage, this is a good way of being proactive in our efforts to help them stay healthy. Even though our vet suggested the PWR for Haley because she’s getting a little older, dogs and cats of any age can benefit from the program. Well, that’s it for my Pet Wellness Report review. I know these kinds of posts can get a little technical and tedious to read, so thanks for sticking around until the end! 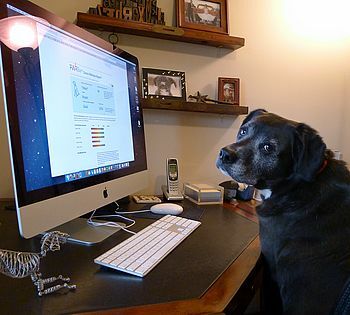 Have you used any health assessment tools or programs for your pets? What did you think? What a neat concept. I like the idea of having a website with all that information about my pets. It is nice having the data online. If my vet could pull the PWR data into his portal website, that would be perfect! I’m really glad I tried it during Haley’s checkup. If I repeat it again next year, it will be interesting to see any trends. Thanks for sharing this information about your experience using the Pet Wellness Report, Elaine. I think it is very useful to get feedback from pet parents about how well they think a product performs. I was very happy with the PWR even though some of the questions were vague. Even if a pet errantly scored low in an area, they still offered good suggestions to follow and an explanation for the low score. For me, the value was in getting comprehensive lab results on Haley. Interesting – I like this idea and may try it out. Both Jack and Maggie need a senior wellness exam soon – good time to add this. It’s really nice to have that peace of mind from getting the comprehensive lab work done, especially with senior dogs. Oh, very interesting. I’d never heard of that before. Since we lost both our previous dogs to cancer, i’m all about the early detection. It does sound like some of the questions are a bit vague though or, as you said, maybe underrated for how good those things are! You’re so right – dogs really hide it when they’re ill so we owners have to be on top of their health! I’m so sorry that you lost your two previous dogs to cancer. Some of our fellow dog bloggers are dealing with this right now and my heart really goes out to them too. It’s good to try to keep them healthy and enjoy every day with them. I like the idea of a pet wellness report. It gives you a good overall summary of your pet’s health. Wish we had them here. It does give you some peace of mind and good tips to prevent illness and disease. Maybe your vet will consider starting a wellness program or you could check the Pet Wellness Report website to see if any vets in your area participate in the program. The one big thing I learned from this is annual blood work and lab work is a probably a good investment. It’s an interesting program. I like how it gives your vet a look at what lifestyle factors could effect your dog’s health. I’ve never heard of this but am definitely intrigued. It would be a wonderful thing to have for trends/changes over time, especially if you move or change vets! You could have everything on hand online. Seems super convenient. That would be a good benefit if you move or decide to change vets. Interesting. I agree that some of the survey questions are too general. Overall, I consider Mr. N to be in good health, and his vet agrees with me. But some of the things I do for his mental and physical health (like letting him hike off-leash for example) would be a con according to this assessment. Yes, we do a lot of off-leash hiking too. I assumed the question meant keeping your dog on a leash if the environment was dangerous or if your dog is likely to run away or get lost. That’s a good example of where some tweaking in the wording of the questions would be helpful. I think the idea of a pet wellness report is a good one in general, but as you said, this particular one should be more detail-oriented & ask more in-depth questions. The price tag wouldn’t put me off, as I believe in investing in preventative measures! I think most dog owners (and cat owners) that would consider paying extra for this type of wellness program are very interested in their pet’s health and preventative care and would welcome in-depth questions and maybe even a longer survey that covers more topics. I’m always excited to learn new things that can keep Haley healthy. This is really cool! I love all the data! Even happier that your girl is so healthy! Thanks for posting up your experience, we have not implemented this at our clinic yet. When clients come in for heartworm tests we offer up doing a mini panel which is a 6 panel internal organ tests to check for kidney and liver problems and checks for diabetes. We then call the owner and go over the results with them. It is good to have bloodwork done each year to catch things early. That’s such a good idea to do blood work annually. In the past, Haley normally only had blood work done if she was having surgery (pre-surgery), but I think this is something we’re going to have done every year now. Yeah, I was surprised about the dark pigmentation issue, but now I’m going to inspect her mouth more often. I think Haley only wanted to make sure she wasn’t going to get short changed on the treats after reading the report, lol! I’m the same way sometimes, Jodi. While I was waiting on the lab results, it was a little stressful but I would still rather know early if something’s not quite right. I do have to fight that “ignorance is bliss” way of thinking sometimes though. Interesting idea, and thanks for such a comprehensive overview! It’s a shame some of those questions were vague, but maybe the company will see this review and tweak a few things. At least, I hope so! Thanks again. Thanks Jean! I’m hoping the PWR continues to evolve because I think it’s a great concept that can really benefit pets and their owners.